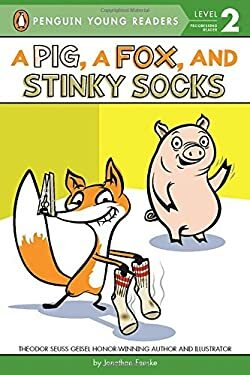 The stars of Jonathan Fenske's 2016 Theodor Seuss Geisel Honor book, A Pig, a Fox, and a Box , are back Pig and Fox are back--and so are their shenanigans Told in a silly three-part story, A Pig, a Fox, and Stinky Socks begins with a prank, with Fox "gifting" Pig with a pair of stinky socks. But what happens when his plan goes awry and the shoe (or sock ) is on the other foot? With comical art and simple language, Pig and Fox's antics in this Level 2 reader will continue to crack kids up. New (29 available) BRAND NEW. Over 1.5 million happy customers. 100% money-back guarantee. Make your purchase count: support Better World Books' worldwide literacy partners.